The Internet seems to be a miracle. Composed of millions of pages accessible from nearly everywhere in the world, this marvel can be hard to unravel as a user. One user who has mastered this skill is Greg Stamm, who began his journey in Web design just four years ago. Stamm had found his passion. It wasn’t long before he acquired his first major Web project — managing the drama department’s Web site at his old high school in Derby, Kan. And by his sophomore year he had moved to North, taking on the Edmond North Key Club’s Web site. Not only did he significantly improve the quality of the site, but he founded a new officer position within the club — Web Designer. From great beginnings, Stamm furthered his career by beginning his own Web site at <https://stammwebcreations.com>, where he maintains a working portfolio. 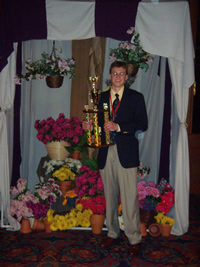 Stamm’s experience with Key Club continued to open more doors for him in the summer of 2007. “I heard from a softball coach that wanted to have a website where fast-pitch softball coaches from all over Oklahoma could collaborate, plan games and get information,” he said. And from great beginnings, Stamm’s clientele grew tremendously. He now manages over 10 Web sites, ranging from a model car company called T-Reproductions in Tennessee to a small business selling horses and border collies. Stamm has also received a number of awards for his Web design, ranging from both a third and first place prize for the Key Club Web site in the Texas-Oklahoma District (T-O) of Key Club International. 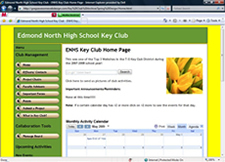 The T-O district contains more than 280 high schools, virtually all of them with their own Web site. Pre-AP English I teacher and former Key Club sponsor Jacklyn Huffman is also impressed with his ability. But for Stamm, all of these projects are just the beginning. Basking in the spotlight: Senior Greg Stamm shows his first place prize for “Best Website 2009” within the T-O District of Key Club. 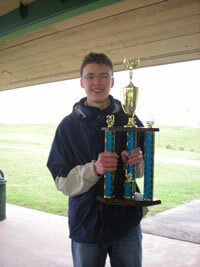 Basking in the spotlight: Junior Greg Stamm shows his second place prize for “Best Website 2008” within the T-O District of Key Club.